Irving, Margaret. "Paris Crew". The Canadian Encyclopedia, 05 January 2017, Historica Canada. https://www.thecanadianencyclopedia.ca/en/article/paris-crew. Accessed 21 April 2019. 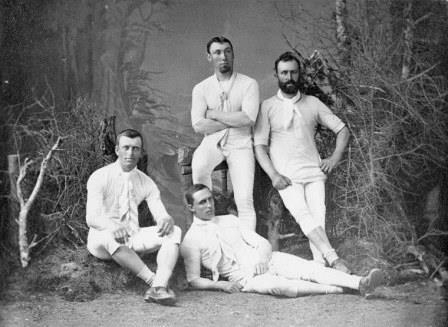 The Paris Crew was a rowing team from Saint John, New Brunswick, that achieved global acclaim days after Confederation by placing first at the International Regatta during the Paris Exposition of 1867. The Paris Crew was a rowing team from Saint John, New Brunswick, that achieved global acclaim days after Confederation by placing first at the International Regatta during the Paris Exposition of 1867. The team won multiple other titles until experiencing its first official loss in 1870 to an English team from Newcastle upon Tyne. During their 1871 rematch, James Renforth, leader of the “Tyne Crew,” collapsed and died. 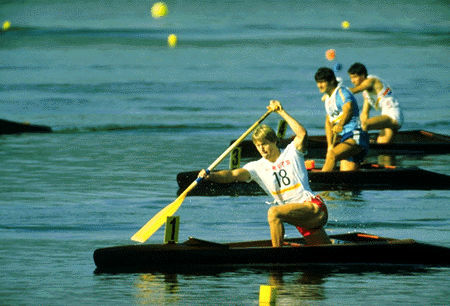 The Paris Crew drew international attention for its accomplishments, contributing to Canada’s reputation for sporting (particularly rowing) prowess and inspiring pride in the young country. In the 19th century, Saint John (New Brunswick) was sometimes referred to as St. John. It is now always spelled Saint John, to distinguish it from St. John’s, Newfoundland and Labrador. Robert Fulton, stroke, is 25 years of age, stands 6ft. 1 in., and weighs 168 pounds. His complexion is swarthy brown, and his face bears the impress of indomitable energy and pluck. His shoulders are broad, chest is well developed, and loins spare. In fact he is in every way beautifully proportioned, and would make a capital model for a sculptor. Elijah Ross, No. 3, is 5 feet 11 in. in height, weighs 158 pounds, and is 25 years of age. He too is of a dark complexion, and is a decidedly handsome man. His muscular development is immense, and his whole appearance is that of a well trained athlete. Samuel Hutton, who pulls No. 2 oar, is of a dark complexion, and has dark brown hair. He is compractly [sic] made, possesses a very considerable development of chest and shoulders, and exhibits every appearance of great strength. From his countenance we should judge him to possess more nervous energy than any of his comrades, and that he is not one of the slow, dogged kind, but rather given to going at things with a view to finishing them in a hurry. He is 25 years of age, stands 5 feet 10, and weighs 158 pounds. George Price, bow oar, is the veteran of the crew, being 30 years of age. His height is 5 feet 10, and he weighs 154 pounds. His expression of countenance is stern, and indicates a dogged perseverance. Unlike the rest of the crew his complexion is light, and notwithstanding long exposure to the sun his skin retains its natural colour. Among the strange-looking people whom this regatta has brought together not the least strange were a certain crew of four sturdy New Brunswickers, who, having beaten everything on their own waters, had brought two home-made boats some thousands of miles to show the rest of the world how to row. With their flesh-coloured jersies [sic], dark cloth trousers, leather braces, and bright pink caps, they were in striking contrast to their neat competitors. Fulton, Hutton, Price and Ross received a hero’s welcome upon their return to New Brunswick and were nicknamed “The Paris Crew” after the site of their triumph. Their next major challenge was in October 1868 when they faced the Ward brothers, a team of talented American siblings, in Springfield, Massachusetts. The Saint John team triumphed again, to the delight of its supporters (many of whom had placed significant bets on the crew’s success). Having previously beaten Europe’s best, the victory over the Ward brothers (who had not participated in the Paris Expo) cemented the Paris Crew’s reputation as “the champions of both sides of the Atlantic.” Their success continued, as the Crew won races in Lachine, Toronto and Niagara during the summer of 1869. In the autumn of 1870, the Paris Crew faced the “Tyne Crew,” an English team from Newcastle upon Tyne led by James Renforth. The race, hosted in Lachine, Québec, was billed by the Montréal Daily Witness as a “match between the champion crews of the old and new worlds.” The Victoria Daily Standard predicted a challenging race for the Canadian team, advising that “[f]oemen of such calibre have not yet been pitted against the Paris Crew, whose easy victories over lesser stars must be dismissed from our minds when estimating their chances of success at Lachine.” In addition to the strength of the opposing team, the Canadian team faced difficult weather conditions. The Saint John Daily Evening News reported that, although “the world and his wife hied off [went quickly] to the race… [and] at least fifty-five thousand souls must have been present,” the beginning of the race was delayed by the Paris Crew’s reluctance to row in windy conditions. Unlike the Newcastle boat, which had barriers to prevent water splashing into the shell, the Canadian boat was vulnerable to waves. The Paris Crew lost the race, with differences in boat construction and rowing style likely aiding the Newcastle team. The loss was such a shock that “many of the St. John followers of the crew had to send home for money enough to bring them back. They had backed their favourites to the finish,” according to the St. John Daily Sun. Despite the loss, the citizens of Saint John received the Paris Crew warmly upon its return to the city. In 1870, England's "Tyne Crew" defeated Canada's celebrated "Paris Crew." During their 1871 rematch, James Renforth, leader of the Tyne Crew, collapsed and died. let out his six front windows for $10, and charged ten cents a head to stand on the ground in front… The St. John people, old and young, rich and poor, were prolific in their display of pink ribbon—Paris crew colors…rarely was to be seen the noble dark blue of the Englishmen. Fundraisers were held in the Maritimes for Renforth’s wife, and the name of the race location was changed from The Chalet to Renforth in his honour. In 1998, Renforth was amalgamated with several communities to create the town of Rothesay, where today James Renforth is memorialized by James Renforth Drive and Renforth Rotary Park. The town also has a sculpture dedicated to the 1871 race and the Paris Crew. 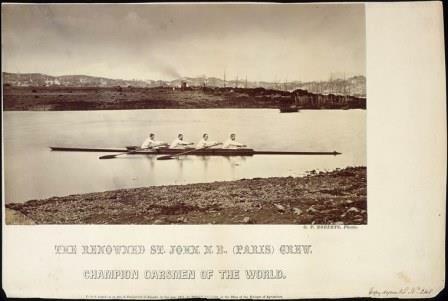 Members of the Paris Crew rowing at Saint John, New Brunswick. In 1871, they raced against the Tyne Crew, an English team that had defeated them in 1870. The “fatal race” of 1871 (as termed by the press) marked the beginning of the end of the Paris Crew’s high-profile career. The team won another regatta in 1873 on the Kennebecasis River but in 1875 tension arose between Hutton and the other members over ownership of the team boat. 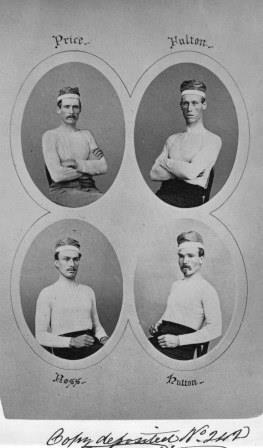 Fulton, Hutton, Price and Ross raced together for the last time in 1876 in the American Centennial regatta in Philadelphia, where they “were badly beaten by a raw crew of Halifax fishermen.” At the same regatta, Torontonian Edward “Ned” Hanlan was victorious in another category, heralding a new generation of talented Canadian rowers (including Alex Brayley of Saint John and Wallace Ross of Memramcook, New Brunswick) and a shift in popularity from four person boats to one-person sculls. Samuel Hutton passed away at age 50 in August 1894 when the yacht on which he was sailing, the Primrose, capsized during a regatta. Robert Fulton competed successfully in individual sculling races until 1874. 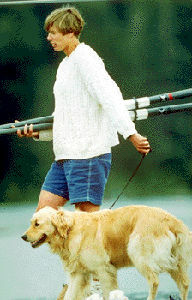 Following his retirement from competitive rowing, he remained active in watersports, sailing and refereeing regattas. According to the St. John Daily Sun, in 1875 he was “appointed a boatman and tide waiter in the customs [service] and was ever a good official.” Fulton passed away in February 1906 at the age of 61 and was buried in the same cemetery as Samuel Hutton. The St. John Daily Sun described Fulton’s funeral as “one of the largest attended in St. John for years.” In his final years George Price worked as a customs official, like Fulton, and died in March 1909. Elijah Ross became a well-respected boat builder. The last living member of the team, Ross sold the Paris Crew’s boat in 1909 and rowed it across the harbour a final time to deliver it to its new owners, a syndicate of Saint John residents, because he reportedly wished (according to the St. John Sun) for the boat to remain in the city. Ross died in November 1920. The members of the Paris Crew were inducted into Canada’s Sports Hall of Fame in 1956 and into the New Brunswick Sports Hall of Fame in 1972. In 2016, the Paris Crew was inducted into the Canadian Rowing Hall of Fame, part of the inaugural class of honourees.